This LP has 47 parts. Original Thread: How the Hell Do We Play Europa Universalis 3? This is an instructional LP of EU3: Divine Wind. I have some friends who bought the game but are basically too scared to try it, so I'm going to try to help ease them in a bit by describing some basic gameplay and explaining game mechanics. I guess Europa Universalis is pretty infamous for its steep learning curve. If you've ever gazed wistfully at other people playing EU3 and muttered to yourself "I wish I could do this...", then you might get something out of this thread. I'm going to post updates with screenshots along with explanations of everything from options and game setup through strategic decisions with my reasoning behind those decisions. Since this thread is meant to be helpful, I'll also try to answer any questions that people may have about game mechanics or gameplay advice. I'd also welcome any other knowledgeable players to answer questions that they have answers to. If you'd like, you could try to play along, but due to random events, different missions, and how other foreign powers grow and fall, our games may diverge pretty quickly. 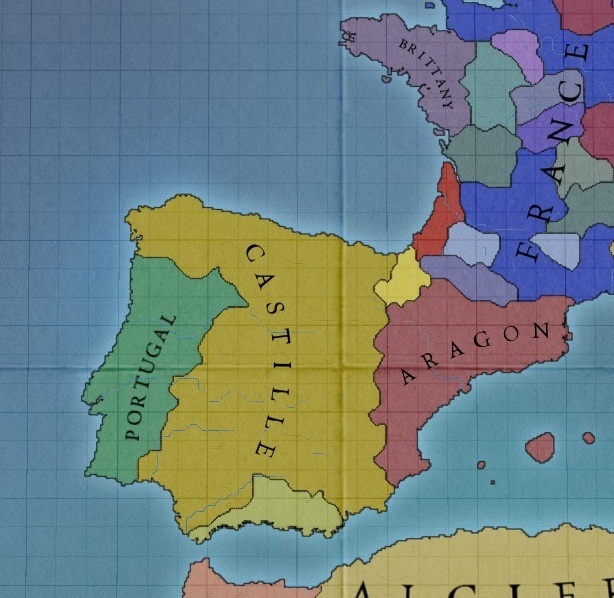 We will be playing as Castille, the largest of the few remaining kingdoms that would come to be Spain. Castille is a good nation for people who are new to the game. Depending on how things play out, we may add to or detract things from that list. One thing you need to do before starting to play a real game is to get your message settings under control. If you start a game with the default message settings and let it run for a month, your screen will be full of hundreds and hundreds of messages and icons letting you know, for example, that Saxony tried to form a Royal Marriage with Lithuania, but Lithuania refused! That's pretty rude of them, but we really don't care. Customizing the message settings so that you only get popups for things that are important to you increases playability more than anything else you can do. If you don't want to go through the hundreds of message settings and tweak them all to your own specifications, feel free to use my own message settings which I've filtered down to pause and display the things that I feel are important: http://www.mediafire.com/?a8hxghya50q0q4k Simply overwrite your own default messagetypes_custom file with this one. I'm going to be playing EU3: Divine Wind, patch 5.1. This is the latest expansion and the latest update. If you are playing Heir to the Throne or In Nomine or something, things might be a little different. If you are playing patch 5.0, things might be a little different. If you have the game on Steam, be aware that Steam has not updated their version of the game to 5.1 yet and you'll need to do it manually. Go to your steam\steamapps\common\ folder, copy and paste the entire "europa universalis iii - complete" folder and rename the copy to "EU3 5_1" or whatever you'd like. Download the official 5.1 patch: http://www.paradoxplaza.com/in-game/eu3/eu3_v5.1.exe and install it to your copied folder. If you wish, you can re-add the patched "eu3game.exe" to steam as a non-steam game so you can still use the steam overlay and stuff. Spanish Empire: A full Grand Campaign, starting as Castille in 1399 and ending in 1821. Covers a wide range of topics and goes in-depth into game mechanics wherever I can. Holland: Starting as a small nation and growing into a position of strength. Austria: Playing inside of the Holy Roman Empire and taking advantage of the HRE mechanics. Tertiary Updates: These games aren't meant to be instructive, like the ones above. These are slightly more narrative and are just about me having some fun.